Simply bring your computer to our office at 172 Imboden Drive, Suite 13 in Winchester, Virginia and please mention this discount at the time of drop-off. You will be assessed a modest Drop-Off fee. The Drop-Off fee cannot be discounted. We will assess your computer, determine the parts required to repair or upgrade it, and call you with a repair estimate. If you approve the estimate, we will perform the repair. Once your repair is completed, we will call to notify you. In exchange for the coupon code you provided at the time of Drop-Off, you will receive a 10% reduction to the labor charge on your final invoice. All offers are limited to bench repair labor charge discounts at the sole discretion of WinTech. No rain checks are available. Not valid on prior purchases, gift cards, gift certificates, taxes or shipping and processing charges. Consumer must pay applicable sales tax. Offer may not be combined with any other sale, promotion, discount, code, coupon and/or offer. Promotions have no cash value. Offer cannot be sold or otherwise bartered. Void where prohibited, taxed or otherwise restricted. Returns of any portion of the purchase will require equal forfeiture of offer or amount equal to offer and may also incur a restocking fee. 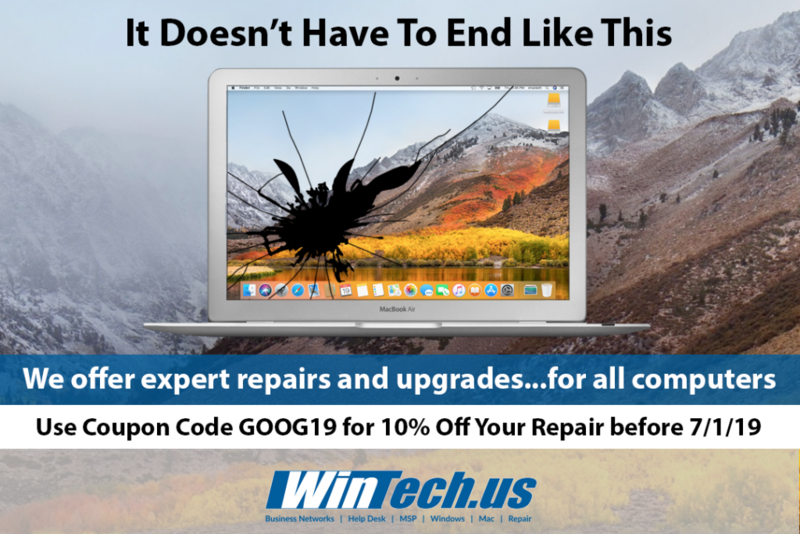 WinTech has the right to end or modify any promotion at any time. Other restrictions may apply. Offers only apply to the United States unless otherwise noted. Would you like more frequent tech news, scam alerts, and new product info? Follow us on Facebook! Please call WinTech for all of your IT needs at 540-722-2122. Ask about our MSP program.